MEDFORD, Ore. (AP) — To the dismay of environmentalists, the U.S. Forest Service auctioned off timber from a remote, burned-over section of a national forest June 9 in the first such sale since the Bush administration eased logging restrictions. A timber company paid $300,052 for the right to log 261 acres of standing dead timber that was burned in a 2002 fire in the Rogue River-Siskiyou National Forest. Gov. Ted Kulongoski said he would seek a court order blocking the harvest, based on a lawsuit that Oregon, Washington, California and Mexico have filed challenging the legality of the administration’s rules. He had earlier asked the Forest Service to delay Friday’s sale. Environmentalists warned that the sale could set a dangerous precedent by opening the door to logging on nearly 60 million acres of national forest. The timber industry and Forest Service said logging the area would speed the regeneration of the forest, but environmental groups said leaving things to nature would produce a healthier forest. “The bottom line is the Bush administration is focusing on unraveling environmental protections,” said Lesley Adams of the Klamath-Siskiyou Wildlands Center. The blaze burned through roughly 500,000 acres in the rugged Klamath Mountains of southwestern Oregon. It was the nation’s biggest wildfire in 2002. The timber sale was on land known as an inventoried roadless area. Roadless areas are generally large tracts so remote and so rugged that logging there has long been considered uneconomical. No new roads are to be built for the harvest, and instead helicopters will fly the logs out. The Clinton administration severely restricted logging in roadless areas, but a federal judge in Wyoming overturned the rule in 2003. 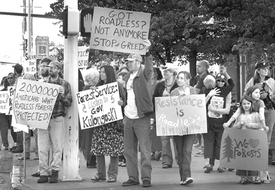 In 2004, the Bush administration adopted new rules that gave states the option of opening roadless areas to logging. Only two bidders took part. The winner, the Silver Creek Timber Co. of Merlin, went more than $64,000 over the minimum bid.